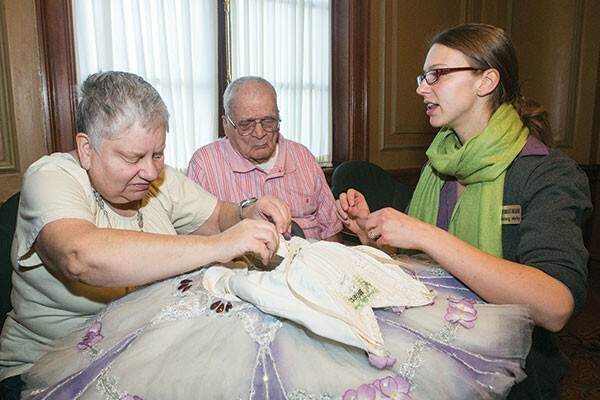 Marty Mathews (left) examines a costume as she and Maurice Johnston take a Pittsburgh Ballet Theatre "sensory seminar" with the PBT's Alyssa Herzog Melby. In the early 1970s, Marty Mathews was a recent graduate of Carnegie Mellon, where she studied piano. Mathews is blind from birth. So whenever she attended a play, the self-described "culture vulture" arrived hoping that one of her seatmates would read her the program. Today, that's less of a problem: Many theater companies offer programs in Braille, or online versions accessible with audio readers. But arts groups, advocates for the disabled and disabled people themselves continue pushing for other forms of increased accessibility — including those that make disabled patrons feel not simply accounted for, but actually welcome. Mathews, for instance, hasn't seen much dance, but she's a Tchaikovsky fan and wanted more. So 90 minutes before October's Sunday matinee of Pittsburgh Ballet Theatre's The Sleeping Beauty, she and a friend joined PBT's Alyssa Herzog Melby in a cozy Benedum Center lounge for a "sensory seminar." Melby, PBT's director of education and community engagement, produced the Lilac Fairy's costume, and Mathews felt the tutu's layered tulle; she discovered that it sticks out, rather than laying flat, like a typical skirt. She inspected props, including the witch's devious means of pricking the princess's finger: "I didn't know that's what a spindle looked like." Mathews also examined two doll-sized, jointed wooden artist's models that Melby used to demonstrate ballet moves. And Melby coached her through acting out Carabosse's sinister pantomime cursing the princess, including an evil, belly-shaking laugh. Following the half-hour seminar, Mathews quipped, "Now I'm gonna be in the ballet, right?" "I like to touch things that I wouldn't normally get to touch," says Mathews, a retired computer programmer who's also done pre-performance "touch tours" of sets at local theaters. Also helpful was the live audio description that Melby and volunteer MaryAnn Graziano did for Sleeping Beauty, outlining the action through headsets for a handful of visually impaired patrons. The PBT's audio-description program began in December 2012, one in a new, citywide wave of access initiatives. For a visually impaired person, the benefits of audio description are obvious. As Mathews says, "It just makes a difference knowing what's going on." Accessibility issues are only becoming more prominent. The PBT plans another sensory-friendly Nutcracker, and then, in February, Beauty and the Beast. The Pittsburgh Symphony just announced its first sensory-friendly concert, next June, and The Andy Warhol Museum is planning sensory-friendly days. 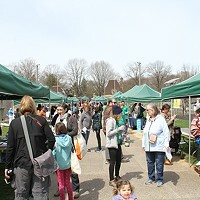 Starting next year, moreover, the sales-tax-funded Allegheny Regional Asset District, with its $91 million budget, will require each of the arts groups and other cultural assets it supports to designate an accessibility coordinator, so that potential patrons will know whom to contact for help. And this year, ARAD set aside $500,000 in grant money for accessibility projects and unrelated "connections" (i.e., merging of operations). So far, only about $234,000 of the funds have been successfully applied for, to fund things like audio guides, accessibility training for staff and even "virtual tours" of physically inaccessible spaces. Pittsburgh in fact is known nationally for how its arts groups cooperate to promote accessibility. "They really work this as a community," says Betty Siegel, director of accessibility at the Kennedy Center. But plenty of work remains. For instance, Joyce Driben, a longtime arts patron who is blind from birth, says that the Carnegie Museum of Art offers no audio descriptions of its exhibits. And unlike museums including the Metropolitan Museum of Art, she says, the Carnegie lacks tactile resources, like touchable replicas of 3-D artworks. Carnegie Museum of Art spokesperson Jonathan Gaugler responds that the museum has some tactile displays in its decorative-art exhibit. And he notes that there is a Carnegie Museums of Pittsburgh initiative to explore adding tactile displays; the Warhol, in fact, has been testing tactile versions of 2-D works like Warhol's soup cans and self-portraits it plans to have on display by the end of 2015. Still, advocates for the disabled say accessibility isn't just about gear (though things like a new automatic door-opener at Downtown's Theater Square Box Office certainly help). It's also a mindset. "Access is really more than compliance [with laws]. It's making people feel welcome and valued," says Anne Mulgrave, GPAC's manager of grants and accessibility. She recalls fielding stories from hearing-impaired concert patrons frustrated by 40-minute delays waits for assisted-listening devices: "People with disabilities felt like they were problems, and they wouldn't show up." "If you care, that's the biggest first step," says Ann Lapidus, who became blind as an adult and now consults informally with arts groups. "How may I help you's the general question to want to ask everyone." Or as Mulgrave puts it, "Accessibility is just good customer service."